"Up north there were so many narwhals that the whole fjord was scented with their breath." AROUND A.D. 1000, Nordic people settled on the islands of the North Atlantic. From here, characteristic narwhal tusks were sent to Europe's large centers of trade, where they were sold as the unicorn's horn for undreamed of sums. 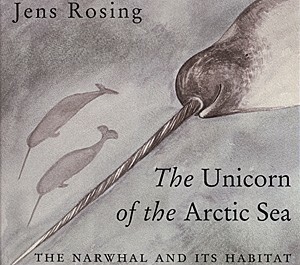 Born in Greenland, the author Jens Rosing chronicles and illustrates the history and lore of the narwhal. This book will fascinate young and old alike as it pays tribute to a fantastical creature that really exists. "Jens Rosing is one of Greenland's thrilling artists, who quite naturally has found many of his subjects and themes in the fauna and nature of Greenland." He was born in 1925, a son of a Lutheran priest in Jakobshavn on the northeast coast of Greenland. Despite enrolling for studies in the Royal Greenland Trading Company in Copenhagen, he left to become an artist, preferring to combine an artistic talent with his life-long interest in folklore, especially that of his native land. He took part in several Greenland expeditions of the Danish National Museum and served as Director of the Greenland Museum from 1976 to 1978 in Nuuk. In 1980 Jens Rosing was awarded the Danish Authors' Association prize for popular science. Naomi Jackson Groves has been a boon to Penumbra Press, helping to shape Penumbra's sensibility, while proffering an oeuvre that shows remarkable range. As a diarist, opening up the diaries from her youth abroad exploring the intellectual and artistic life of Europe in the 1930's and 1940's. As the author or editor of books about her uncle, Group of Seven artist A.Y. Jackson. ("A courageous little cuss" is how her uncle sized her up, after her wartime travel in waters infested by German submarines.) As the translator of works by Greenland artist and author, Jens Rosing. As the generous spirit encouraging several other Penumbra projects off the ground. She is renowned for her critical writing and translations of German sculptor and dramatist Ernst Barlach. Naomi Jackson Groves specialized in German and northern languages. Born in Montreal in 1910, she would graduate from McGill University with a B.A. in 1933 and an M.A. in 1935, from Radcliffe College in 1937, and from Harvard with a Ph.D. in 1950. In addition to teaching German at McGill and Carleton Universities, she re-established and headed the Fine Arts Department at McMaster University (1951-57). Active into her tenth decade, she passed away in December of 2001.